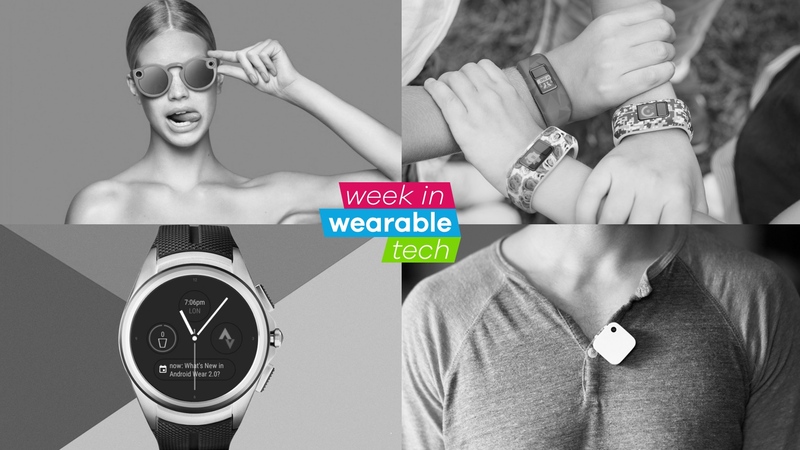 Welcome to the Week in wearable tech, where we round up all the stories that are shaping this fast and furious world of connected devices. It's been another seismic week, with Snapchat getting in on the wearable tech game and showing us that perhaps smartglasses aren't dead after all. With Garmin aiming its new fitness tracker at kids and Android Wear suffering a big setback, it's been quite the week of news. Read on to get fully caught up. Snap Inc (Snapchat to you and me) is launching a pair of hipster video camera sunglasses for $130 later this year. The Snapchat Spectacles take 10 second clips of circular video that sync as Snapchat Memories, which can be shared via the social network. There's been a bit of a return to form for smartglasses recently, with the Oakley Radar glasses also muscling in on the game this week, too. Make sure you check out our round-up of the best smartglasses, as well as the best AR and VR headsets money can buy. Garmin has taken the wrappers of its new fitness tracker, but runners and cyclists stand down, this one is strictly for the kids. The Garmin Vivofit Jr is a 5ATM rated band designed for four to nine year olds and comes in camo, lava and flower patterns. The idea is to get kids active for 60 minutes of play a day with goals set by parents. Check out our line-up of the best smartwatches for kids, as well as our guide to the best GPS trackers for children, an area of wearable tech that's gaining in popularity to give parents extra peace of mind. Ugh, this is Not Good. Google has announced that Wear 2.0 has been pushed back to early 2017. That means the latest and greatest improvements that we've been waxing lyrical about on Wareable won't be upon us until after the holidays. Wareable editor-in-chief Paul is incensed about the delay and you can read his pessimistic take on the situation, but if you'd rather keep a more positive frame of mind then check out our guide to Android Wear 2.0. If you've been holding out for Wear 2.0 and can't wait until next year to buy a smartwatch then check out our guide to the best smartwatches money can buy. The big news of this week is that the shortlists for the Wareable Tech Awards in association with Currys PC World are GO. We've released the potential winners of 11 categories of the best wearable devices, startups and collections. The winners of each category will be announced at the Wareable Tech Awards bash on 27 October in London – and stay tuned for how you can vote for the Wearable of the Year category in the coming week. While Snapchat is bringing the idea of lifelogging back into the mainstream, it's all too late for Narrative, which has shuttered the company. The maker of the Narrative Clip 2 has called time on its line-up of personal wearable cameras, saying that it "can no longer continue sales and support of the Narrative Clip." We've long speculated about the downfall of lifelogging, but if wearing a camera is your cup of tea, check out round-up of the best action cameras money can buy. Heart rate tracking wearables are exploding in popularity according to a new report on the state of wearable tech. According to the NPD Group Connected Intelligence Wearables Industry Overview and Forecast, built-in heart rate tracking has surged from 12% of fitness trackers sold to 44% in just one year. We've been diving into heart rate tracking in-depth over the last few months, in order to help understand how tracking your bpm can help you achieve your fitness goals. Check out our guides to resting heart rate and the best heart rate monitors. And don't forget James' heart rate training diary, exploring how you can plan your training around your ticker.